On her recent trip to Japan, Karan from the UK office went in search of art, creativity and luxury in Kanazawa. Here, she participated in a gold leaf experience, learning more about Kanazawa’s most famous export, and decorating her own product in the process! Kanazawa (金沢) literally means “gold marsh” and is certainly a glitzy place. It is home to Kenrokuen, one of the most beautiful gardens in Japan, and much of the old castle town remains preserved. Kanazawa is full of beauty and art and prides itself on its local arts and crafts. The craft it is probably most well-known for is its gold leaf production. Kanazawa certainly lives up to its name and has been dubbed the “Town of Gold Leaf”, producing over 99% of Japan’s gold leaf. I was lucky enough to be able to experience this unique craft and immerse myself in this important part of Kanazawa’s culture and history. Waiting for my gold leaf decorated chopsticks to dry is the perfect excuse to explore more of the fascinating workshop. Gold Leaf Sakuda was launched in 1919 as a gold leaf wholesaler, but later started crafting their own items using gold leaf and even launching a cosmetics line. There are a few different locations, but I made my way to the main store in Higashiyama. It is a short 5-minute walk away from the nearest bus stop, but I think it is quite difficult to find so taking a taxi or private car may be the safest option. The nearby Higachi Chaya district is also worth a visit to see Kanazawa’s historical Chaya houses, some dating as far back as 180 years. 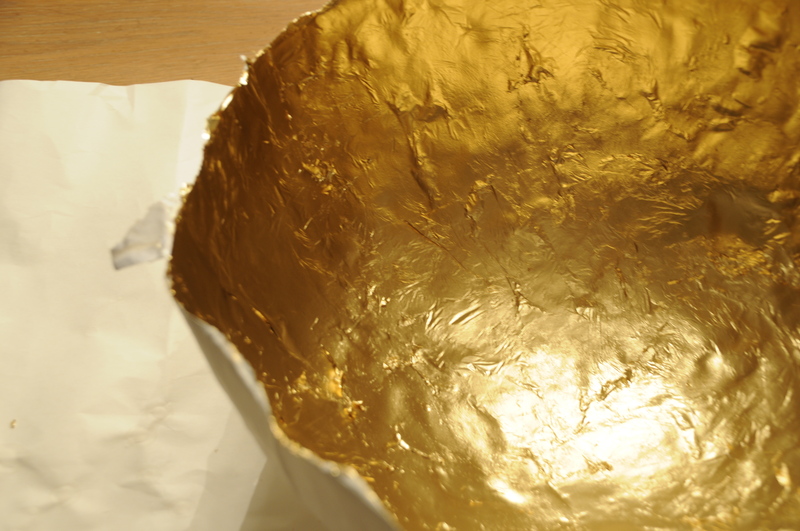 The Kanazawa Yasue Gold Leaf Museum is also only a 2-minute walk away from the workshop. Gold Leaf Sakuda has a shop attached to the workshop, and it was the shop I initially entered before being shown into the workshop. The shop is full of so many beautiful items, which I had a chance to browse later. In the workshop, there were three craftsmen studiously applying the precious gold sheets to various items. I was asked to choose any item I wanted, and each item was clearly displayed with examples and prices. I decided on the glossy black chopsticks as I thought they would look nice with the shiny gold leaf as a contrast. The crafts room was through a small door next to the workshop and had a dedicated craftsman supervising those taking part in the gold leaf experience. He gave a very detailed explanation of what we would be doing and showed me several examples of chopsticks from which I could take inspiration. First, I was asked to coat the top of my chopsticks in masking tape in a nice pattern. Then the craftsman coated the chopsticks in glue and asked me to wait 10 minutes for it to dry a little. It was during this period that I took the opportunity to explore the shop. At Gold Leaf Sakuda, they produce a variety of beautiful items: from tiny glass sake cups with subtle flecks of gold, to large gilded statues, Sakuda has something for everyone. I was also served the famous gold flake tea as I perused the shop. Even the bathroom was coated entirely in gold! I made my way back into the crafts room and continued with my experience. The craftsman showed me how to first roll my chopstick in the gold leaf and then brush the gold into each crevice, making sure to cover the entirety of the chopsticks. The final, and most nail-biting step, was peeling off the masking tape to reveal my masterpiece. 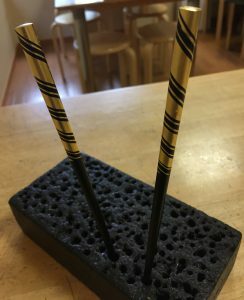 I was very pleased with the final product and I was given a box to store my chopsticks in with strict instructions not to touch them for a month in order for the glue to dry fully. Decorating my own glitzy chopsticks gave me an insight into the heart of Kanazawa’s most famous industry. I enjoy dining with my luxurious chopsticks, each time reminded of my visit to Kanazawa. In short: This is a great experience for those who want to have a hands-on experience of Kanazawa’s arts and crafts culture and understand one of its biggest industries. Recommended for: Anyone with an artistic flair, or an interest in Kanazawa’s arts and crafts. It is quite an easy workshop so I think I would be a great experience for older children.